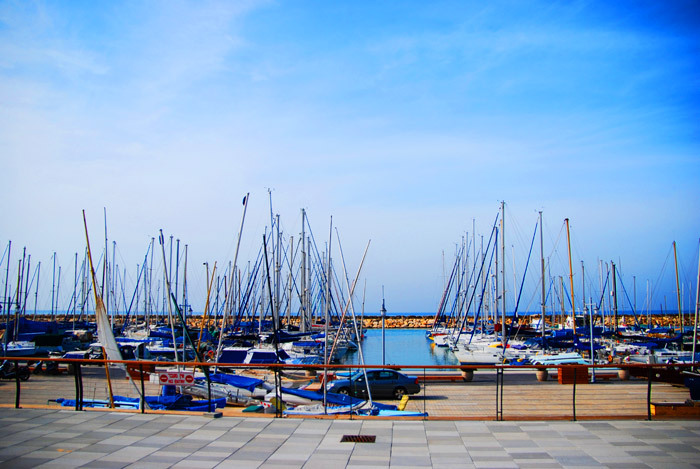 Many Tel-Aviv residents and definitely most tourists don't know that there is a beautiful promenade which connects the southern part of Jaffa to the southern part of the Hertzliya coast. The promenade which was only recently completed has become one of the nicest attractions of Tel-Aviv. So if you don't have a problem with cycling, and you feel like enjoying one of the most beautiful and romantic routes in the city, then it is worth sticking around for the rest of this article. So the first question is probably - where can I get a bicycle from? It's really very simple. Many Tel-Aviv hotels rent out bicycles or even lend them free of charge (to guests of the hotel). If you are not lucky enough to be staying at a hotel which rents out bicycles you can always rent a Tel-Aviv bicycle from – TELOFUN. If you're not familiar with this public bicycle rental project you can read more about it by following this link. So after you have equipped yourself with a bicycle (and a camera) all you have to do to get started is to get to the Jaffa Port area and from there start cycling north towards the coat of Hertzliya. It is a total of 9km from Jaffa to Tel Baruch, and of course you don't have to complete the entire route (don't forget you'll have to cycle all the way back…) but we promise you that the further you go the more you will enjoy yourselves. When you take the northern exit from Jaffa Port you will pass several very picturesque parts of Jaffa. The first is the port itself. In the last few years the ancient port has undergone restoration work to make the most of the port's potential and bring out its inherent beauty. Apart from its rich history and fine restaurants, the area is an incredible place to take pictures. The place's authentic beauty together with the water and sunshine makes for incredible photos. From there, continue north towards the beaches of Tel-Aviv, but not before following the Jaffa promenade dense with ancient and beautiful historic structures and an ancient wall. If you look towards the water you will notice the famous Andromeda Rock, you can read the full story of this site by following this link. After passing all of these sites you will reach the green Charles Clore Park. Here you will be able to enjoy cycling literally a few meters from the water and enjoy one of the best places to watch the sun go down. 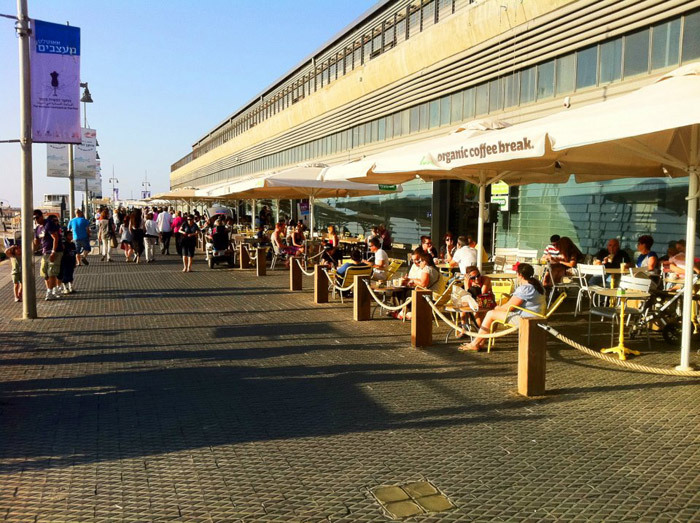 After riding for a kilometer or two along the promenade (make sure to stay on the bike path) you will get to the Tel-Aviv Marina where you will find additional great photo ops and enjoy a few good cafes. Continue north until you reach the Tel-Aviv port. 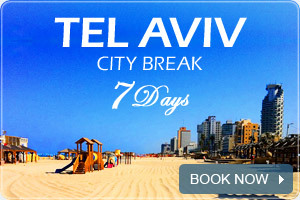 Today Tel-Aviv port is considered one of the finest areas in the city. Here there is a dynamic nightlife (for a list of bars and clubs in the port area click here), shopping area, cafes and the famous port market (for further information on the market). The ride through the port is one of the nicest, the ride is within touching distance of the water, so much so that occasionally the spray from the waves will reach you. At the northern point of the port you can cross over the bridge above the Yarkon River which empties into the sea. Across the bridge you will be able to see the Tel-Aviv power plant right above you. To all those who are not in good physical shape there's no reason to be scared, the whole route is flat and if you don't do it during the hottest hours of the day you're also likely to get the pleasant breeze coming in from the sea. Don't think too much go ride your bike.